Importance. 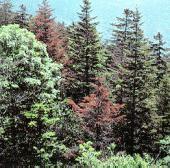 - The balsam woolly adelgid was introduced from Europe around the turn of the century. It has become an important pest of true firs and is established throughout the Fraser fir type in the southern Appalachians. It is a serious pest of natural Fraser fir and also causes considerable damage to the Fraser fir Christmas tree industry. Identifying the Insect. - Adult adelgids are blackish purple, roughly spherical in shape, less than 1/32 inch ( 1 mm) long, and almost invisible to the naked eye. The adelgid produces a covering of white wax threads and appears as white, woolly dots about the size of pin heads on the surface of the tree's bole, limbs, and buds. Eggs are produced under the adults and are orange in color. The immature stage of the adelgid, known as a "crawler," is also orange, with legs and black eyes. Eggs and crawlers can be identified with the aid of a hand lens. Identifying the Injury. - During the adelgid's feeding process, the host tree is stimulated to produce abnormal wood cells. This reduces the tree's ability to translocate food and water. Initial symptoms of adelgid attack may include gouting of buds or twig nodes and some twig and branch dieback. This is very evident on seedlings, young understory trees, and Christmas tree plantings. Other damage mav be stunted shoot and needle growth and loss of apical dominance in natural stands. A heavily infested tree may die within 2 to 7 years. As the tree, dies, portions of the crown or the entire crown will turn red. Biology. - The adelgid has two generations per year, and occasionally three in the southern Appalachians. Eggs of the first generation hatch in late June and July, followed by a second generation in September and October. The "crawler" is the only mobile stage in the adelgid's life cycle. When a crawler begins feeding, it transforms into a first instar nymph and becomes stationary. Reproduction is parthenogenic; each female lays up to 200 eggs. 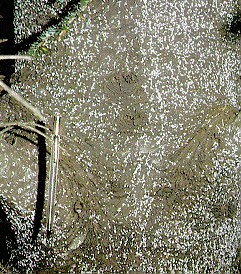 The adelgid overwinters as a first instar nymph and continues its development in the spring when the host tree starts its annual growth cycle. Control. - Chemical control is effective, but extremely costly. Thus it's usually limited to high value resources such as recreation areas, seed sources, and shade, ornamental, and Christmas tree plantings. 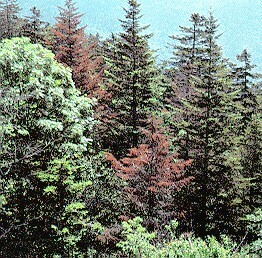 Other control measures include removal and destruction of infested trees.